Kaja have developed their own unique style of music reflecting innovation as well as tradition. Klezmer and other Eastern European Folk music is the foundation, adding layers of film and contemporary music, Tango, Swedish folk tunes and improvisation. With their second album “Rust”, released at Kakafon Records the 20th of September 2010, Kaja is given a unique spot on the World music scene. During starlit sparkling Swedish winter nights, to accompaniment of sea gull and squeaking Gothenburg trams, and on train rides between east and west, the music of the album Rust has been created. Together, the three musicians have sought a way to make the new compositions come alive through surprising arrangements as well as intimate interplay. The album contains both melancholic and playful melodies, richly ornamented and fully harmonized. All resting on grounded, groovy rhythms. The music finds its fuel in Eastern European Folk music traditions, but the experimental parts makes the genre Kaja´s very own. Rust is outspoken, deep-rooted, wide and meandering. The album contains ten tracks divided into three chapters. Four compositions have been recorded live at Fågelbergskyrkan in Mölndal, and six at Studio Epidemin in Gothenburg. Eloquently and crafty played by Livet Nord, violin and viola, Camilla Åström, accordion, grand piano and Daniel Wejdin, double bass. There are some all Swedish names on the cover. No wonder. These are melodies steaming of the Balkans, Tango feeling, musette waltzes, and gypsy violin traditions from the East. And they are played with that incredible mixture of total passion and stringent abstemiousness and control; a style otherwise only mastered by eastern Europeans, Argentinians and Flamenco Spaniards. Accordionist/pianist Camilla Åström has written most of the melody drenched numbers, where the Gothenburg trio Kaja use blue notes of a kind B B King has never found and which stings better than schampoo in your eyes. If one wants to know how much a single violin (played by Livet Nord) can express, just go straight to the track ”Lullaby for Mira and Idun”. Is it groovy? It´s groovy. This trio start off in the soil of Eastern European folk music and let their originally composed arrangements stretch upwards on a winding journey. The music of Kaja is pensive, empathic and rich. It sounds like Kaja have taken everything in life, distilled it on a bottle and shaken it. To gently uncork it is like diving straight into the instrumental soundscape of Kaja. Here, French accordion waltzes share space with fiery Klezmer, stealthy back beat with cinematic melancholy, and a languorous interplay in three musical chapters. Sometimes it is hot and out of breath, sometimes it is tranquil and sliding. A good soundtrack for the upcoming autumn, where it is a place for both rush and rest. Trio Kaja play cross-fertilized Folk Music in a nonprejudiced atmosphere of salty darkness and melancholic seriousness. But they also sweeten the ears with brisk attacks of young fresh oxygen into the old traditions. Original compositions in three musical chapters that throb with influences, from a foundation of spirited Klezmer to a surface of fresh French waltz, talented Tango and strict Swedish Folk traditions. Livet Nord’s violin creates breathtaking melodies with a raw elegance. The pulsating accordion in the arms of Camilla Åström is a magnificent and rejoicing power station. Daniel Wejdin’s vigorous double bass is a reinforcement bar of steady rhythm. Rust contains exceptional music with dear harmonies, enamoured rhythms and bold arrangements. THE MANY LAYERS OF TRADITION. 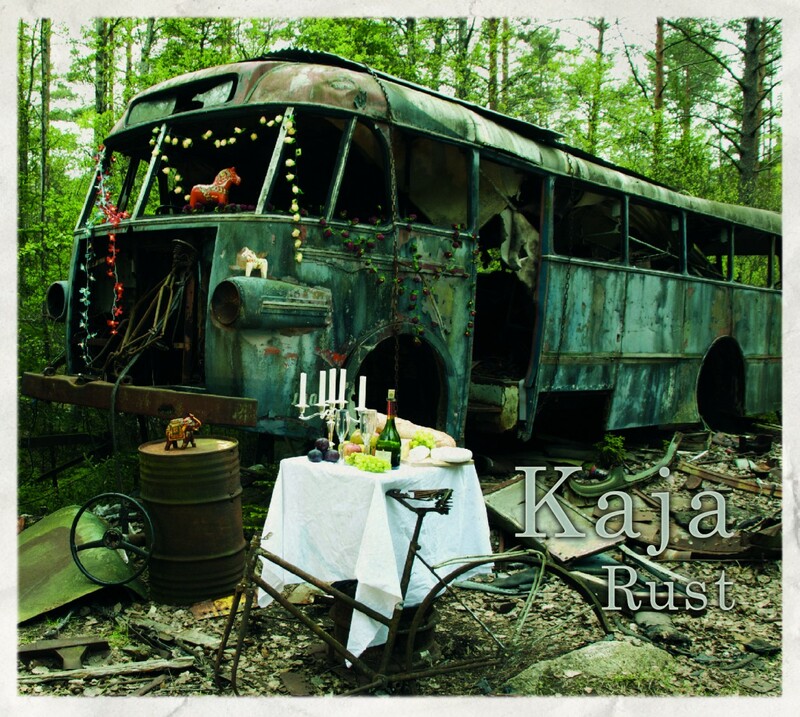 Listening to Kaja´s second instrumental album is like constantly being transferred between geographic areas, genres, and layers of cultural impulses. They treat their listeners to their newly composed music, which has a foundation of a classic musical expression, primarily through the violin and viola of Livet Nord, but which is pervaded by Eastern European folksiness and Klezmer, Latin Tango moves, French swirls and Swedish old-time pace. Kaja have arranged their limitless music in a most ingenious way, where rich and sublime expressions find each other in a constantly varying and groovy rhythmic. Camilla Åström, who has composed most of the tracks, handles her accordion as if all emotional expressions in the world were in her hands. The double bass of Daniel Wejdin is sensitively holding the trio’s earthy interplay within a solid form. Through the group sweeps musical winds and influences from many directions, which gather in a surprisingly powerful repertoire. Kaja´s views and wide horizon give them material to find new expressions in their music. There is a thrill and magic that make every track grow into a kind of world of opportunities, which they really use in their daring composing. Kaja is a Gothenburg trio that creates ebullient and vital music that sounds like nothing else. With a starting point in various musical expressions from different directions, they mix their own particularly attractive stew. Music with an improvisational glimmer and at the same time, in it’s evident elegance so overwhelmingly skilled and virtuosic, it sounds like it should have been very strictly arranged in the compositions already. There are three high class musicians who combine high level of playing skills with an equally high level of improvisational feeling and ability. Livet Nord, violin, Daniel Wejdin, double bass and Camilla Åström, accordion and piano. Three musicians with a striking breadth and versatility in their play. Bustling Klezmer, Tango, Eastern European folk sound, a bit of Swedish folk music, and a lot more is the foundation for the vital, captivating cheerful and sparkling music. Which contains some Contemporary music but flavoured with a great deal of wilfulness. With their few instruments, Kaja create a rich sound. Nice harmonies and rhythmical. With constant exciting digressions and changes. They change style within tracks in an impressively natural and smooth way. With impressive flexibility through daring adventurous arrangements, and strong dynamics in both interplay and change of musical style and atmosphere. Kaja experiment and create a music that finds new paths for how to handle multifarious styles. And it is absolutely fabolously good.